It was clear after my moto ride around the northern part of Phu Quoc yesterday that today I would take my leave. I wanted to reserve my judgment until I had at least seen some more of the island. Well, I had seen it – and from what I could ascertain, the whole island was a veritable construction site – I felt like I was in the middle of watching infrastructure being created – or an island-wide roads work project – it wasn’t pretty and it wasn’t paradise. Rather than belabor the point of not liking it so much, I decided that the reason I went there was to meet Graham and Tim, the beautiful men who ran Hotel A74. Their leave-taking yesterday to Saigon (Ho Chi Minh city) for a week’s holiday also cemented my decision to go – our conversations were truly the highlight of my visit to Phu Quoc. With them gone and my visit to half the island leaving me less than ho-hum, I packed my bag and was ready for my long-awaited and anticipated journey to the Mekong Delta, a place that conjured in me atmospheric waterways, floating markets and lives being led the ways they had been for generations. For once in my life, I easily left the beach behind. Binh, the other extraordinary person who is Graham and Tim’s main man there, also runs his own small travel agency. At a mere 21, he’s incredibly patient, capable and kind and he arranged everything seamlessly and graciously for me, my prior cranky indiscretions long forgotten. And now I’ve arrived – at Hung’s Homestay – the best use yet I’ve made of Trip Advisor. 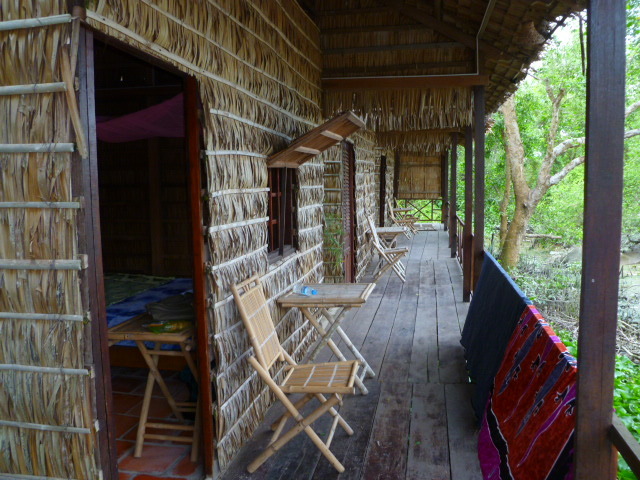 I wouldn’t have found it without TA, so I’m very grateful for that site right now as I sit, riverside, on the wooden balcony of my thatched-all-around bungalow with a sweet breeze wafting right up from the water to my perch where I’m watching the tide bring the water, clumps of water hyacinths and lotus flowers upriver, which it will turn around and bring downriver when the tide changes in a few hours. I’ve unpacked, showered (cold water only, but having had a hot shower for the past three nights, I found I didn’t even use it – I’ve getting quite accustomed to the refreshment called a cold shower! ), had an ice-cold beer; and while road weary, I am delighted to be here. There are only 8 bungalows on offer – $12 per night which includes breakfast and dinner. Assuming the food is good, this is the deal of the century! It’s quiet (of course there’s some whirring scooters in the distance but not loud and not horrendously so), peaceful and this is what I’m looking for – a rarity already, I have discovered, in this country of 90 million people with most of them, it seems, on their motorbikes all at the same time! Now the sounds are of people talking in their homes across river, birds chirping in the trees, roosters crowing and children playing. 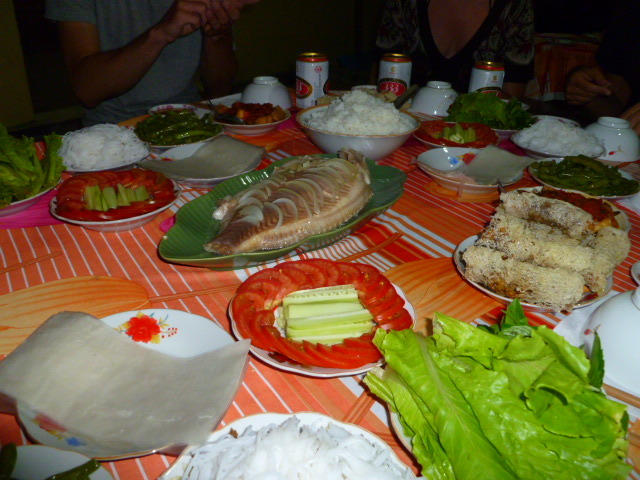 It’s the Mekong Delta – I have arrived. 6:30 am Breakfast, which was included at A74, a nice touch. 7:00 am Mini-van pick up at Hotel A74 to take me to the port – since I was taking the ferry to a different city this time, the van went first to the first dock and then to the one I was leaving from. Now I’ve traveled with some crazy drivers – I mean, I’ve been on chicken buses in Guatemala and there are no vehicles more renowned for their crazy drivers than them … but today’s mini-van driver gave even me the shakes. Maybe it didn’t help that I was sitting shotgun – he drove so fast and so close to other scooters that I’m still amazed that no one was mowed down. He passed every single vehicle that was in front of us, and he laid on his horn almost the entire time. It was one of the most harrowing one-hour rides I’ve ever taken. I looked at him incredulously several times – he looked back at me and laughed. Yes, he laughed out loud when he saw the looks on my face – what nerve, a maniac driver and tickled with my terror on top of that. What could I do but laugh right back at him?! 8:00 am Ferry ride from Phu Quoc to Rach Gia, a big bustling city that left nothing to be desired in my short glimpses of it. Ferry ride, again non-eventful save for the blaring, noxious movies playing throughout the ride – volume on “loudest” and the movies always seem to be the same – some kind of Asian slapstick violence – plenty of blood and plenty of laughter from the Vietnamese people sitting all around me. The seats are set up in rows of 4 on each side with an aisle in the middle – no place to go outside for a view or fresh air – stuck inside with blaring TV – again, thrilled to have my I-pod with me that brought some relief. 10:30 am On-time arrival at the Ferry Dock – Binh told me that the bus company offered a free shuttle to the bus terminal, but I couldn’t find that anywhere – with only 30 minutes until the bus departure time and not completely clear about how long it would take to get to the bus station, I finally relented to the moto driver who kept asking me if he could take me there – yes, you can. I jumped on the back of his moto and we were there in 10 minutes. 11:00 am A small bus from Rach Gia to Can Tho, the main and capital city of the Mekong Delta. The bus was waiting when I arrived – I found my way to my assigned seat and all was fine. We left about 11:20 (on time here in Southeast Asia) and with the horn blaring, again almost constantly, we headed to the Delta. We took a short food break along the way and I read, napped and enjoyed the view as the cities made way for the countryside and the ever-present rice paddies were made all the more beautiful in colors of green I had yet to see on this trip. We approached the big city of Can Tho (350,000 people) and we were a good 45 minutes late. I was hopeful that Hung had waited for me. We had been in email contact over the last several days, arranging my arrival; and last night the final piece of the arrangement was made when Binh so graciously called him to give him my arrival information. He would have a sign with my name on it, he had said. Now I hoped, hoped, hoped he was there. It had already been 6½ hours of travel and I didn’t have much energy to navigate a big city if I had to make other arrangements. Patience and humor, I reminded myself – breathe, relax – whatever will be, will be. 2:45 pm The bus door opened to a sea of moto drivers and other awaiting people. And there he was, holding up a sign, upside down, but it didn’t matter – “Welcome Christina to Hung’s Homestay” – I exhaled luxuriously and gratefully. He greeted me with a big smile and a big hug – wow, that was even more of a surprise – and led me to his moto. I gladly hopped aboard and we headed to his home. Well, not quite yet. We drove through the big city, through traffic, pot holes and more blaring horns. Traffic was congested and several times I tightened into the seat lest my legs bump the moto next to me. Soon, the roads turned into lanes and before I knew it, we were out of the big city and riding on dirt tracks. We shared a few words – he told me he had lived where we were headed all his life and in fact, generations of his family had as well – I was thrilled to hear this – it was just what I was after on the Mekong. Hung greeted people as we passed so I assumed we were coming closer. He made a few calls on his phone (yes, of course while driving!) and soon we arrived at the river’s edge and he stopped the bike – “here you will take the ferry across the river and my nephew is waiting for you on the other side; I go to pick up some more people.” The river wasn’t very wide, maybe 100 feet, and I saw a woman paddling over the dilapidated wooden boat (ferry is a stretch, but I guess that’s really what it is). Hung put my bag in the boat, gave me a hand and he was off – an elderly woman and a young girl got on with me – we gestured greetings – and the young girl handed the ferry woman 500 dong (a few cents) … in less than a minute, we were across. Indeed, there was a young man standing there waiting for me, gave me a hand, took my bag and we walked along the very thin, bamboo dock that brought us to the land on the other side. 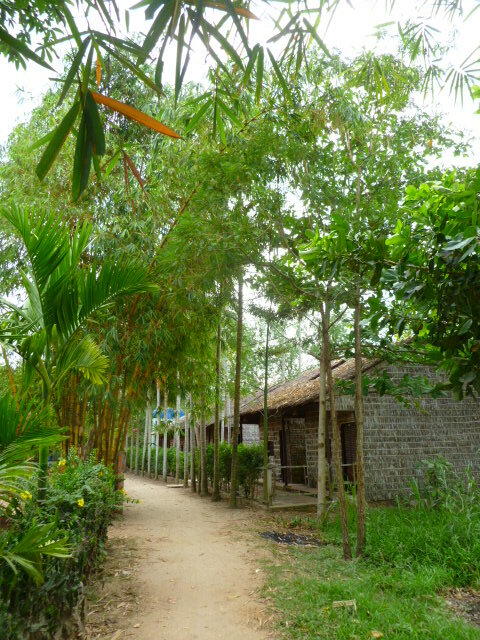 We hopped onto his moto and now we were on an even narrower track, bumpy and pot-holed, through a densely wooded lane – a few houses dotted the sides of the path, chickens skittered out of our way and then I saw them, several thatched bungalows riverside and a long row of several tall palm trees – we slowed and got off the bike. We had arrived. I thanked him with a warm smile and he showed me to my room. After 8½ hours, the day of travel had finally come to a close! My spirits were lifted and I felt rejuvenated just with the arrival. 3:30 pm There are no other guests. Not yet. I acquainted myself with the surroundings – nothing touristy here – the neighborhood is just that – a neighborhood of people who look like they’ve been living this way as long as they’ve been living here – indeed, this is just what I wanted – yippee! 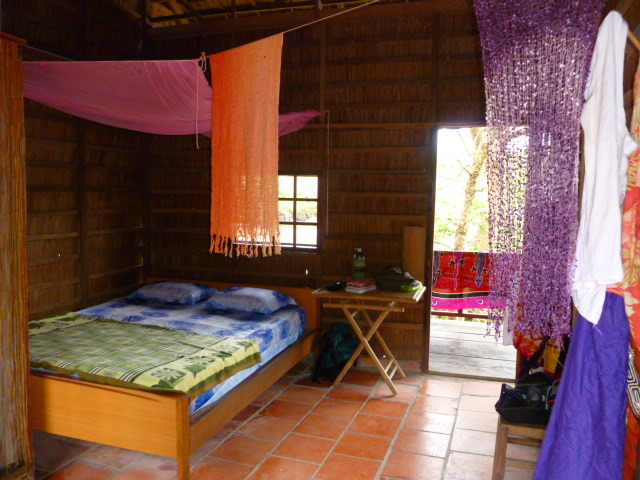 I unpacked everything (yes, I will likely stay put for a bit here, I imagine, as I’m hoping it’ll be a good base from which to explore the Delta) and made the bungalow my own, complete with sarong and scarves decorations! Then it was time for a relax, which I took gladly in quiet sitting on the balcony and writing this short overview of my day. Soon it will be time for dinner. Until then, I’ll stay put right here, watch the light leave the day over the river and give thanks, once again, for this beautiful day. I’ll post more another time about this glorious day today – it’s been a full and fabulous one from 6 am until now, 6 pm. The smells are wafting out of the open-air kitchen – getting ready for another incredible dinner – here’s a photo of last night’s! Everything tasted even better than it looks! Congrats! What a travelogue – and what a lovely place. Your bungalow looks heavenly. The food looks incredible. Have a wonderful stay! You were due a good day, I’d say! It must’ve been amazing to look up and see a “Welcome Christina” sign…you deserve it, dear! How very homey and “you” your darling little bungalow looks. I’ll look forward to hearing more about the area you’re in in future posts. Enjoy!